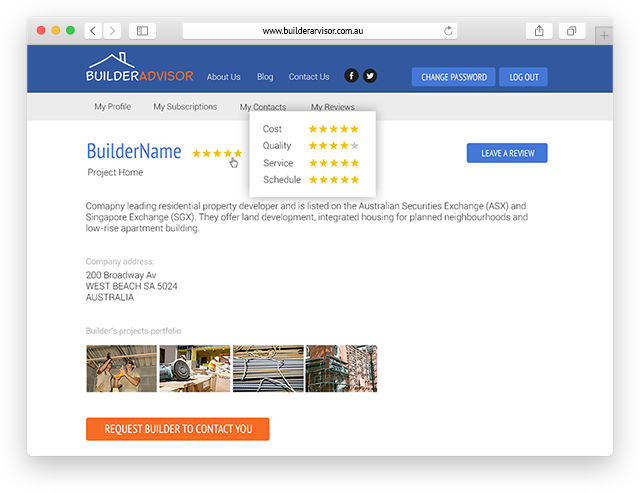 Builderadvisor — developed by A2 Design Inc.
BuilderAdvisor is a safe and secure marketplace for builders and homeowners. The process is simple for users, looking to find the most suitable contractor to build their house: read builders’ reviews, search for a specific builder and see what his ranking is. Homeowners can then pick who they like based on reviews and ask the builder to provide a quote. After completion of the project, the homeowner can post a review and even pictures of the completed project. 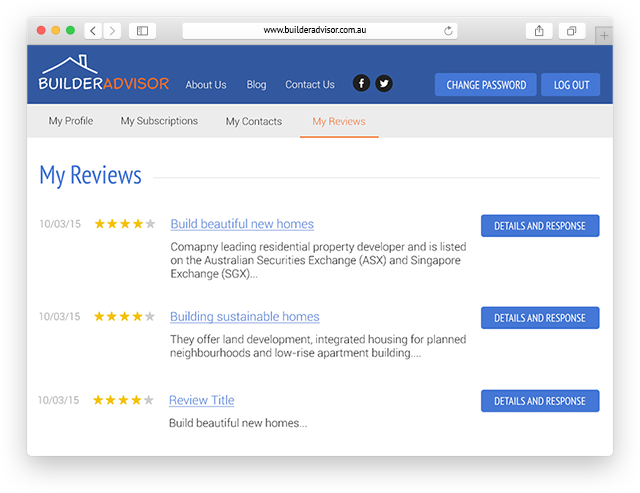 BuilderAdvisor is an Australian startup. At the very beginning the client had a clear idea about the desired results. The website had to be fully functional but the same time we had to plan the development within the limited budget. We had to include all the necessary functionality and think about the optimized solutions that would help to save budget and not to miss anything. The biggest challenge was to squeeze in a lot of functionality, required by the client for the MVP (minimum viable product) to launch the platform. The client is a startup, and as any startup, who hasn’t reached for investors money, they had limited budget. In web development it is possible to build any particular feature in either difficult (read - fully automatic) way or on the contrary - make the feature work but no means is it polished or finished. Facebook polished and improved their features for several years. No wonder they say web development of a successful web application/ website is never over. Anyway, at the planning stages there were a lot of discussion as what features to include and what to leave out and this some concessions had to be made. The whole idea for this web application was to build a fully functioning product that can be used by builders to find their clients and respectively for the clients to find the most suitable builders. But since BA is a startup, everything had to be done within budget limits. 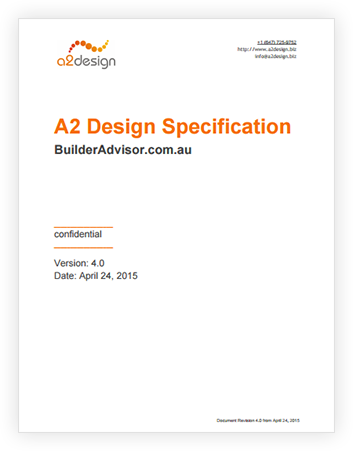 To have a perfect understanding of the project’s scope, A2 Design team created a specification document: the project requirements were defined and documented. The project was of a big scope, so to facilitate the process, the work was divided into 7 iterations. Each Iteration combined the logically connected tasks. Each development cycle was followed by thorough testing and debugging. So major defects were tracked at early stages and when the project get to the final stage it was almost ready to go except some cosmetic changes. In close cooperation with client during weekly meetings and progress reports, some details evolved and changes were implemented. Thanks to Iterative Waterfall Approach, all the parties participating in the development and the client had a really good understanding of what was going on at any given time. And the client always was in control. When such big projects are under development, it’s easy to lose control over it, especially for those clients, who have not had any experience with IT project management, and most of the startups owners certainly haven’t. Thus, Iterative Waterfall Approach allowed to resolve such problems. 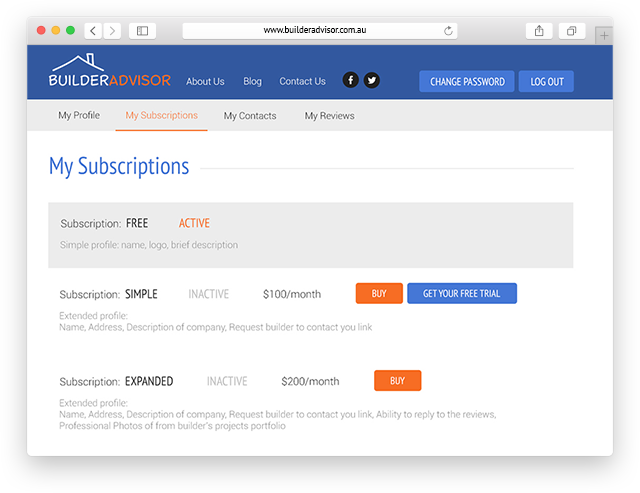 Builder is able to manage his public profile, choose his subscription type and see his lead and potential contacts. Subscribe to simple or expanded plan and activate contacts. 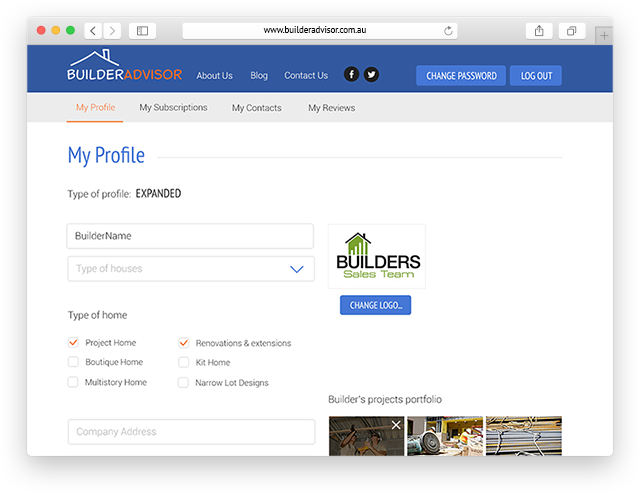 Builders profile is a private area where builders can access and manage their profile. 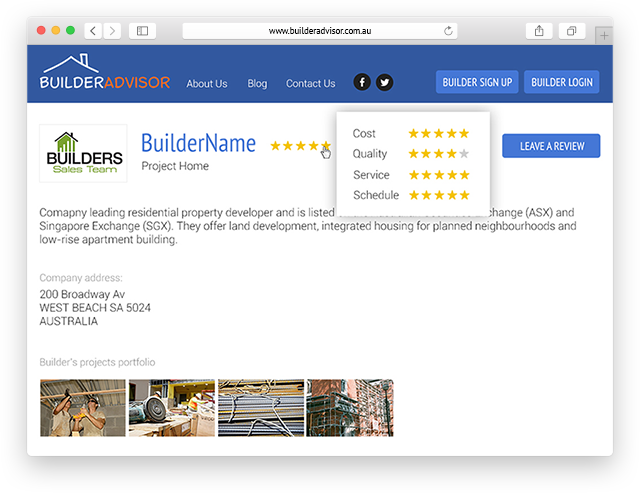 There are four tabs where builders can edit company details, choose and subscribe for suitable plan, activate contacts, view the reviews and leave a reply. It presents an automatized process of selecting the best builders matching a particular request. The only thing user has to do is choose the criteria of the desired house and the system, thanks to the special algorithm, will automatically match the user with 3 most suitable builders. Subscriptions are realized as one-time payment with intend to develop to the recurring system in the future. Users can try simple plan for free during one month of trial period. Third party services: Sendgrid and Twilio were integrated to send notifications to builders. 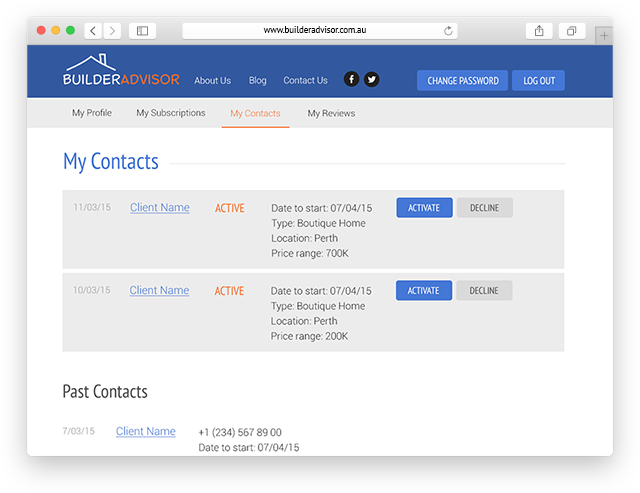 Builders are notified with the direct lead request by email and SMS. Also builders get informed about all the requests posted through ‘Find a Builder’. The system sends emails to all builders with the required type of construction and located within 50 km radius. The system offers paid subscriptions: Simple and Extended. In addition to it, contact activation requires payments. Thus, we’ve integrated Stripe as a payment gateway. If the builder is contacted by a potential customer, he is notified. In order to see the client’s information, builder has to activate them. New contacts might be activated from ‘My contacts’ tab in builder account. 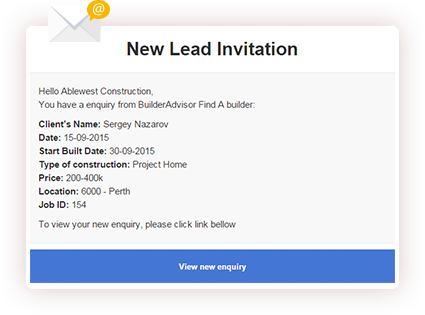 Builders get notified about new leads (through Find a builder of direct request) by email and/or sms. For starters, all the builders can activate three contacts free of charge. Each additional contact has to be paid for. Unlike many modern marketplaces, like Freelancer.com - BuilderAdvisor allows to reply to the customer’s feedback, whether positive or not. Sometimes, no matter how hard you try, many things can go terribly wrong. It’s important to have your voice and explain the situation. Otherwise, builder’s reputation can be ruined irreparably. 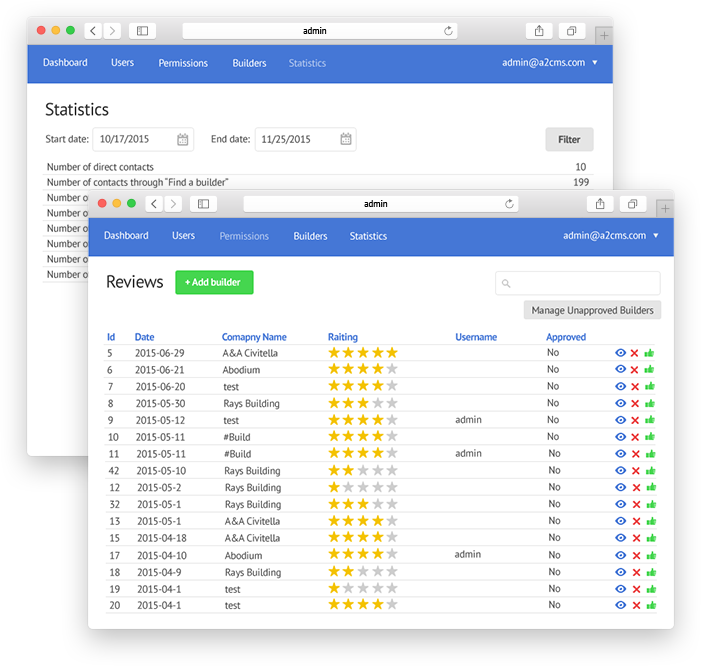 Apart from admin’s standard functionality, such as adding and deleting users and builders, approving new builders requests and reviews to appear on the website, admin can also track activity on the website with the help of Website Statistics. That is needed to follow users’ activities and build up a development strategy for the future. By having real-time information at hand, the owner can plan future steps accordingly and not waste money on unnecessary features. All new builders can use the service for free and update their public profile with basic information. At the same time, they also have a chance to try benefits of the paid account. Simple plan might be activated for free for a trial period. Free trial is a way to convert users from using the service for free to regular customers. 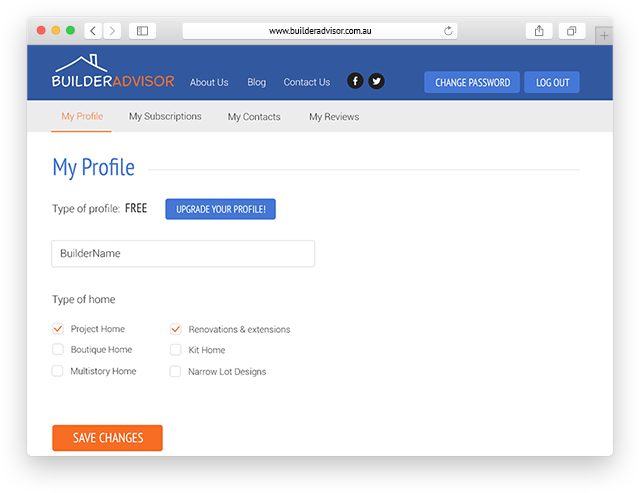 Location field is prepopulated with database of Australian builders. Just start typing postcode number or city name and choose your location. Quick access to public builder profiles. Start typing the company name you are looking for, choose the company and hit search. 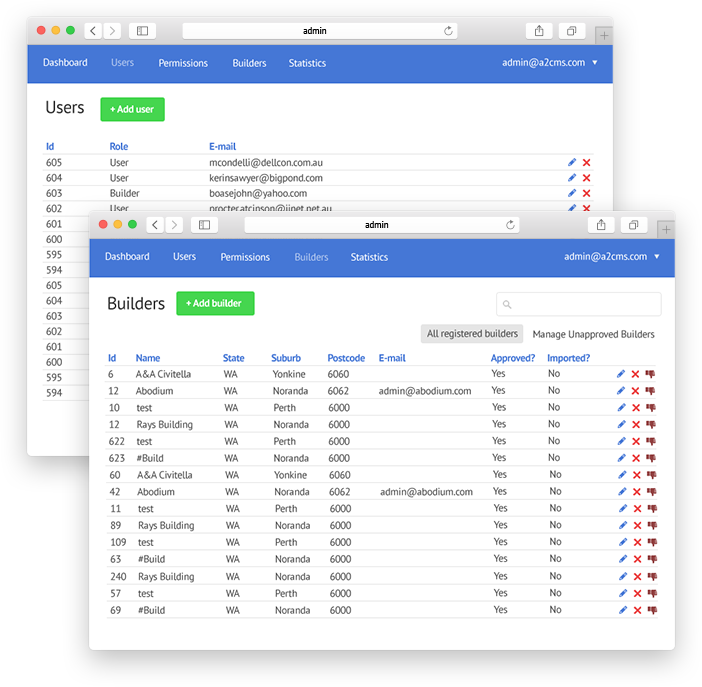 Sendgrid and Twilio services were integrated for notification system for builders. Sendgrid is used for emails delivery and Twilio sends text messages. Payments are accepted via Stripe service. Builders ranking is calculated based on many factors, such as customers’ reviews (positive or negative), profile completeness, type of subscription. This allows the website to be impartial. 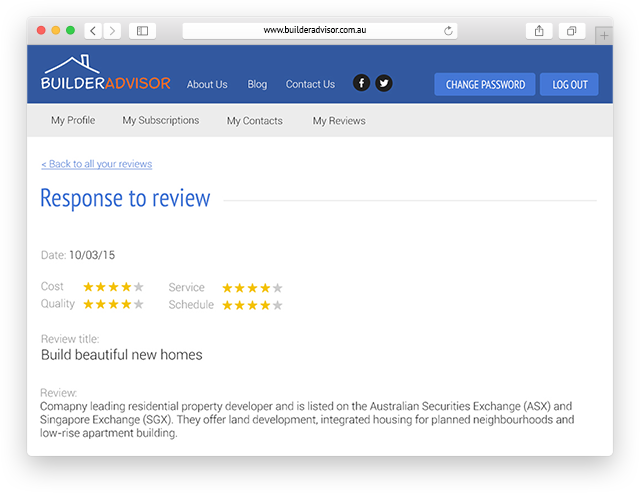 In the Reviews page builders with the highest overall rating are displayed on top of the page in each location. For ‘Find a Builder’ builders are compared by following criteria: type of construction + 50km radius from postcode entered by user + highest star rating + subscription. Public profile is builder’s calling card. The website features the most important information about builders without any unnecessary clutter. All the information is accessible from the private area for builders. Ratings are based on the client's opinions shared on the website. The best builders matching certain project requirements are automatically selected from the builders database. The goal was to make the platform a reliable advisor for users. Reviews is the main focus of the website. The best builders in certain areas can earn their spot in the Most Popular Builders section on the home page. Fully functional website allowing to rate and search builders. Search Builder functionality. Quick access to public builder profile. In order to search for a builder, the user has to start typing the company name and choose the one they are looking for. The database is constantly growing and expanding with new builders being added every day. 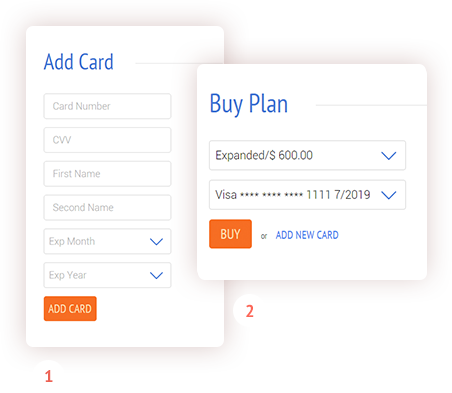 The web application is built on a CakePHP framework which allows it to grow and be expanded in the future without the need to rewrite the whole thing or build it from scratch. CakePHP provides resources for a very scalable model of coding. For the specific search request users can contact a particular builder from builder’s public profile directly by Request builder to contact you. This way builder will get notification via email and sms both, so he’ll get back to the customer asap. © 2018 A2 Design Inc.